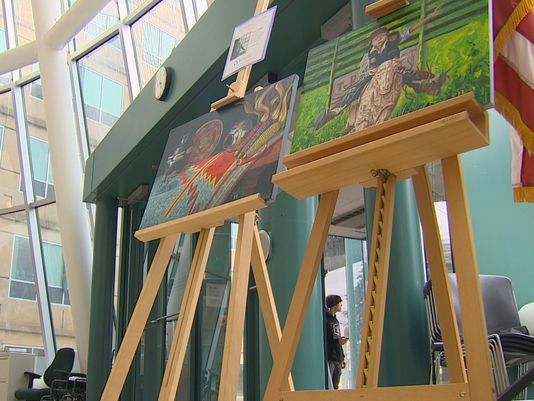 National American Indian Heritage Month runs throughout the month of November, and Washington Department of Labor and Industries in Tumwater, Washington, participated with an art exhibit featuring work by Native artists. But a decision to remove some pieces from the exhibit has raised First Amendment concerns. The four pieces in question were painted by Leonard Peltier, a Anishinabe-Dakota activist who is currently serving two consecutive life terms in prison for the 1975 shooting of two FBI agents during a confrontation on the Pine Ridge Indian Reservation. Peltier painted the pieces in prison, and Peltier’s son Chauncey contributed them to the exhibit. Peltier’s conviction has been long criticized, with supporters maintaining his innocence, decrying racially biased legal proceedings, and calling for clemency. When it appeared that President Bill Clinton would grant the last, hundreds of FBI officers protested, and Clinton took no action. With regard to the exhibit, the Society of Former Special Agents of the FBI sent a letter requesting the removal of the paintings. As Washington NBC news affiliate KING 5 reported, retired FBI agent Ray Lauer, a member of the Society, said Peltier is “…nothing but a thug. He’s an unrepentant cop killer.” The Washington Department of Labor and Industries capitulated and declared that they would rotate the paintings out of the exhibit. Whether it is a designated public forum, in which the government opens public property for expression, or a limited public forum, where public property has been opened for a limited purpose, restrictions on speech need to be viewpoint-neutral and reasonable in light of the purpose of the forum. The show at the rotunda was limited to the work of Native American artists. Inventing a new category of restricted speaker — in this case, convicted murderers — for exclusion after the exhibit has been put on display, and after complaints from a specific group, is neither viewpoint-neutral nor reasonable in light of the purpose of the exhibition. In closing, NCAC declared that “The very functioning of a democratic society depends on the ability of a diverse public to voice a variety of opinions without fear of retaliation by the government,” and urged the department to uphold First Amendment principles and to leave the paintings in place. You can read the entirety of the letter here.